Injection of an adenoviral vector encoding pancreatic transcription factors induced insulin expression (red) in mouse pancreatic ducts. Ductal tissue is shown in green and nuclei in blue. YUHAN WANGOne strategy to treat type 1 diabetes, where the immune system destroys insulin-producing β cells, is to convert other cells into β-like cells that then take over insulin production. 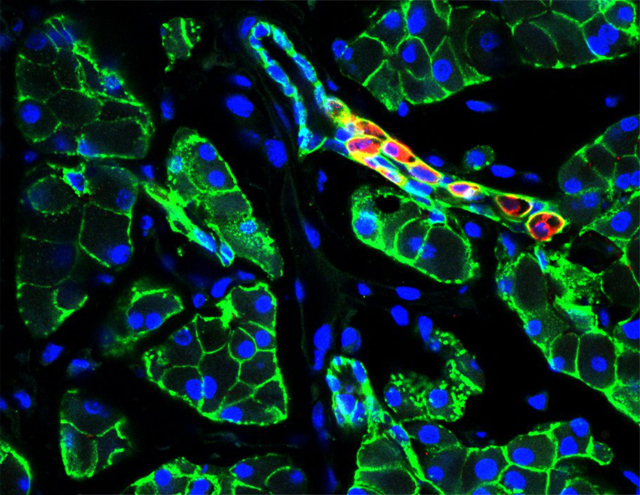 In a study published today (May 2) in Molecular Therapy, researchers reprogrammed pancreatic duct cells in vivo to successfully treat both genetically and chemically induced diabetes in mice. In the latest study, the researchers intravenously injected diabetic mice with a virus loaded with the genes for Pdx1, Neurog3, and Mafa—transcription factors that had already been shown to reprogram cells to a β-like state. The team first targeted the mice’s liver cells, called hepatocytes, and found that after the injection, the hepatocytes that were altered by the transcription factors initially made insulin and could reduce levels of high blood sugar in the mice. But the cells did not respond appropriately to low glucose levels by turning off insulin production, and their ability to make insulin didn’t last, so the mice ended up with high blood sugar again. The hepatocytes also did not express characteristic β-like genes, suggesting that they were not truly reprogrammed. Viral injections into the duct systems of the liver and pancreas also induced insulin production in both types of duct cells. The team observed that the insulin-positive duct cells of the pancreas turned on greater numbers of characteristic β-like genes compared with the insulin-positive liver duct cells. 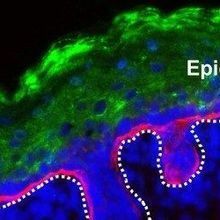 The insulin-positive duct cells of the pancreas also turned off genes specific to the cells’ identity before transformation, while the insulin-positive liver duct cells did not. A majority of the insulin-positive cells were originally pancreatic, not liver, duct cells, the authors also found. The researchers then showed that viral injections to the ducts eliminated diabetes symptoms—namely, high blood sugar—during an eight-week experiment in 30 percent to 40 percent of the diabetic mice. The rest of the treated mice showed only transient improvements or didn’t respond to the injections at all. 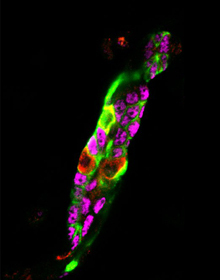 Susan Bonner-Weir, a diabetes researcher at Harvard University who was not involved in the study, points out that this type of injection in people could result in inflammation of the pancreas and that, even if new β-like cells are made, they likely will be destroyed by the immune system in patients with type 1 diabetes. “It’s really a violent destructive force,” she says. 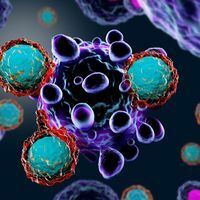 “The fear that many of us have is that if you come up with an endless supply of β-like cells, and you don’t find a way to permanently and safely reeducate the immune system, you’re going to create fuel for the autoimmune fire,” Kushner says. Wang, who is now a postdoc at HHMI Janelia Research Campus, acknowledges these concerns and says the group plans to explore alternative delivery methods for the transcriptions factors, evaluate safety, and investigate the role that autoimmunity could play in the approach. Y. Wang et al., “Long-term correction of diabetes in mice by in vivo reprogramming of pancreatic ducts,” Molecular Therapy, doi:10.1016/j.ymthe.2018.02.014, 2018.